We've been busy this summer and not just with hiking, climbing, and paddling. We've been adding some cool new features to our website and are excited to unveil mountaineers.org 2.4 including improvements for books, feedback surveys, and searches. We added "feedback surveys" for all of our programs. Activities (aka "trips"), courses, course-related activities (lectures, field trips, and seminars), and events scheduled from now on will all have a feedback survey available. This will make our participants and students feel valued, and allow our volunteers to hear how great a job they are doing and how they can improve from the people they are serving! 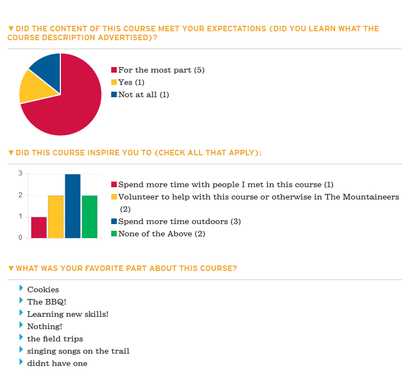 This replaces and expands on the the separate, external systems we were using to collect feedback on trips and courses. Feedback surveys are available to participants the day after the end date of all activities, course, and events. Visit our Feedback Surveys page in our Leader Resources area to learn more about giving and receiving feedback. We added a Required Reading field to our courses so instructors can specify the books students will need to have for a course, as opposed to ones that are merely recommended for additional understanding. A Recommended Reading field has been added to blog posts and events to highlight books that are integral to an event, such as an author presentation, book launch or How To demonstration. Books that are Required Reading or Recommended Reading are now shown during the course and activity registration processes, so you can easily purchase them, if you desire, right when you're registering. When you're signed in, you'll now receive your member discount automatically for books, so you no longer need to remember, lookup or enter a discount code. We added the ability to retire old editions of books, so the ones listed in Activities, Courses, and Route & Places will always be the most current. We added a "Keep me logged in" checkbox to your login. It is effective for 30 days from when you check the box and login or until you choose to log out. Images are published as soon as they are uploaded, saving you from having to find and publish them after adding them to an activity, course page, committee, blog, etc. The text of PDF files, Adobe's Portable Document Format, uploaded to our website is now indexed and searchable in our site search and our new search portlets. We can add a search portlet to any of our pages that searches just within that section of our website. Visit our new The Mountaineer Annuals page or our good ol' Leader Resources page to take these for a test drive!